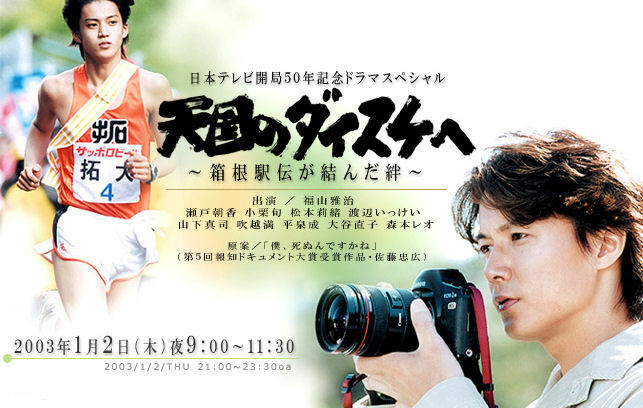 After making a serious error in his news story, political newspaper reporter Yohei Iida grudgingly takes on an assignment for the sports section to write about the Takushoku University track and field team as they prepare for the annual Hakone relay road race after a 13 year absence. During the course of covering this team, disgruntled Yohei meets optimistic and promising runner Sato Daisuke who is determined to lead his university team to victory, and even has dreams of someday making it to the Olympics. As Yohei struggles to deal with his problem-laden work and personal life, he discovers that 23year-old Daisuke has been diagnosed with a life-threatening illness. Inspired by the young runner fighting back against the acute disease with the same determination he had while training for the relay race, Yohei makes an important promise to Daisuke.Will this heartbreaking, yet, heartwarming experience be enough to change Yohei’s cynical perspective of life and finally give him courage?